The girls secretly follow Michelle when she goes to audition on Broadway in the first season finale of Bunheads. When a fire threatens Paradise, Michelle and Bash turn the dance studio into an evacuation center on Bunheads. 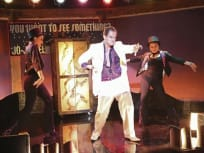 "There's Nothing Worse Than a Pantsuit"
Talia tells others her big secret while Sasha and Roman let people know they are dating and Ginny begins to feel neglected on Bunheads. Fanny doesn't take it well when Milly begins to dictate how a a recital should be run. Scotty and Michelle's road trip takes an unexpected detour on Bunheads. "The Astronaut and the Ballerina"
Michelle's brother visits and Ginny feels abandoned after Melanie joins roller derby. "I'll Be Your Meyer Lansky"
The girls are continually fascinated with their newest classmates and Sasha faces an upcoming move from Paradise on Bunheads. "Channing Tatum Is a Fine Actor"
What a hilarious episode title! This Season 1 installment is titled "Channing Tatum is a Fine Actor." Michelle readjusts to life in Las Vegas on this Bunheads installments. Elsewhere, Sasha pushes back her return home. On the season finale of Bunheads, can Fanny and Michelle keep their relationship on track as the prepare for a recital. "No One Takes Khaleesi's Dragons"
On Bunheads, Michelle must handle a difficult barista and Melanie observes changes in Ginny.